In what’s great news for fans of climbing stuff, Microsoft’s original orb-chasing classic Crackdown has finally joined the Xbox One backwards compatibility list in style – and it’s available as of right now. 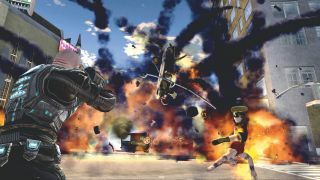 The Xbox 360’s open-world action game has been given the full Xbox One X enhanced treatment, meaning it runs at a higher resolution than before, and boasts nine times the pixel count (4K as opposed to 720p). Crackdown’s not the only new game on the One X enhanced list. CD Projekt’s seminal The Witcher 2: Assassins of Kings, open-world (well, open-Colorado) racer Forza Horizon, and that game where you play as a mute orphan, Fable Anniversary, now have far more beautiful pixels, making it a grand total of 11 Xbox One X Enhanced Xbox 360 games. Here’s the full list of Xbox One X enhanced Xbox 360 titles, which you can also play on your Xbox One and Xbox One S, minus the upscaled graphics. Games aside, you can also select a new graphics option for enhanced titles from within the emulated Xbox 360 blade system on the Xbox One X. You can enjoy them with that pixel and resolution boost, increased texture detail and antialiasing — or you can turn all of it off and see what that game looks like on Xbox One or S.
Press “View” and “Menu” buttons on the controller to pull up the Xbox 360 guide, then flick across to the “Settings” blade. Select “Xbox One X Settings”, and then optimise for “Graphics” or “Performance”. Once you’ve changed it, you’ll have to restart your game. We're yet to test this feature to see what difference 'Performance' makes to the frame rate over 'Graphics', so stay tuned. For now, enjoy one of the greatest open-world orb collect-a-thons ever made, until Crackdown 3 finally launches on Xbox One X. What do 4K and HDR actually mean?